1 Mix all marinate ingredients. Place half the marinade on the bottom of a glass container. Layer the lamb chops on the marinade. Cover the lamb with the remaining marinade. 2 Marinade, refrigerated, for 90 to 120 minutes. 3 Place cherries in just enough water to cover. Simmer covered on medium heat until the skins break. Reduce heat to low and uncover. Simmer until reduced to about ½ cup. Strain and return to a simmer until reduced to ¼ cup. Keep warm. 4 Bring stock to a simmer and reduce to ¼ cup, while the lamb is marinating. 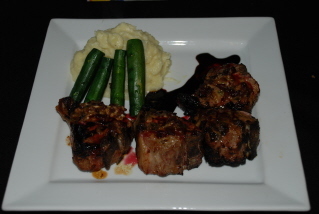 Both cherry and lamb reductions are used in the plating. 5 Preheat a grill to 600°F. If on ceramics, reduce heat to low and place the lamb, reserving marinade, on the grill, 5 minutes per side for medium rare. 6 After turning the lamb, add one tablespoon of marinade to the top of each chop. 7 Plate with the stock reduction under the lamb, and cherry drizzled over the lamb. 8 Serve with mashed potatoes and vegetables. This recipe is a challenge to all restaurant chefs and sets the standard for lamb.